Properties in Charles Krutch Park average 4.6 out of 5 stars. Beautiful luxury cabin with amazing views. Property 5: Beautiful luxury cabin with amazing views. COME FISH IN OUR PRIVATE LAKE...PAY FOR 6 NIGHTS AND GET THE 7TH NIGHT FREE !! Property 6: COME FISH IN OUR PRIVATE LAKE...PAY FOR 6 NIGHTS AND GET THE 7TH NIGHT FREE !! PERFECT 1 BR-1.5 BATH! /HOTTUB! /WIFI! / WASHER/DRYER! /CLOSE TO PARKWAY! Property 10: PERFECT 1 BR-1.5 BATH! /HOTTUB! /WIFI! / WASHER/DRYER! /CLOSE TO PARKWAY! VERY CUTE 1 BR 1.5 BA /HOTTUB! / FIREPLACE / WIFI! /CLOSE TO PARKWAY! Property 11: VERY CUTE 1 BR 1.5 BA /HOTTUB! / FIREPLACE / WIFI! /CLOSE TO PARKWAY! Property 12: CUTE 1BR-1.5 BATH! -- $99/NITE! /WIFI! /HOT TUB! /PKWY CLOSE BUT IN THE MTNS! SWEET 1BR 1.5-BATH -- $99/NITE! /PKWY CLOSE! /WIFI/! HOT TUB! /NESTLED IN MTNS! Property 14: SWEET 1BR 1.5-BATH -- $99/NITE! /PKWY CLOSE! /WIFI/! HOT TUB! /NESTLED IN MTNS! Property 15: Sevierville Cabin w/Deck & Hot Tub-10 Min to DT! 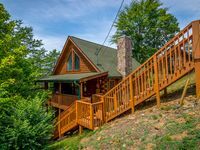 Sevierville Resort Cabin w/Patio, Porch & Hot Tub! Property 19: Sevierville Resort Cabin w/Patio, Porch & Hot Tub! Custom Sevierville Log Cabin w/Spa - on 10 Acres! Property 25: Custom Sevierville Log Cabin w/Spa - on 10 Acres! April Sun-Thurs Stay 2 nights get the 3rd Free! Weekdays only. Property 30: April Sun-Thurs Stay 2 nights get the 3rd Free! Weekdays only. 2BR-2BA/ AMAZING MTN VIEW!/ HOT TUB!/ POOL TBLE!/ FIREPLACE!/ CLOSE TO PARKWY! Property 32: 2BR-2BA/ AMAZING MTN VIEW!/ HOT TUB!/ POOL TBLE!/ FIREPLACE!/ CLOSE TO PARKWY! Property 33: COME FISH IN OUR PRIVATE LAKE...PAY FOR 6 NIGHTS AND GET THE 7TH NIGHT FREE !! April Special For Open Dates! Fantastic Location, Great views, hot tub! Property 42: April Special For Open Dates! Fantastic Location, Great views, hot tub! Declan's View - Cozy 1 bedroom with Game room and Great Mountain Views! Property 43: Declan's View - Cozy 1 bedroom with Game room and Great Mountain Views! Great location and Views! Private! Perfect for your Family to Reconnect! Property 44: Great location and Views! Private! Perfect for your Family to Reconnect! It was fun family gathering, place was neat and well maintained. Keep up the good job !!! !